Elsie is determined to win a scholarship to Shining Birches (an exclusive music summer camp in Massachusetts that you might know by a different name), even though, as an incoming high school freshman, she'll be one of the youngest applicants. 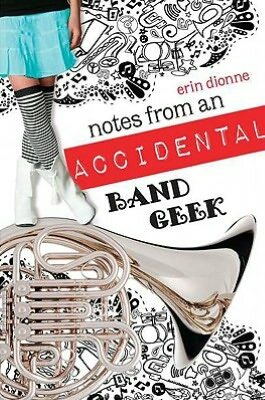 To fill out her resume, she enrolls in marching band. But when she starts, she absolutely hates it: the marching is boring and physically arduous, the other kids make fun of her, and they make her play a mellophone! It all seems like a worthless distraction from practicing for her audition. To make matters worse, starting high school has its own challenges: there's boys and overly-protective parents to deal with. Friendships have grown much more complicated. There are times when Elsie simply can't cope! But as the Fall progresses, she slowly gains confidence and develops the skills necessary to figure it out. A charming book. While it has lots of wonderful band details, it's the painfully realistic depictions of the melodrama of ninth-grade relationships that makes Dionne's writing so good. I liked Elsie's awkwardness with boys (and their's with her). The jealousies and suspicions had a familiar ring to them. I also found Elsie's relationship with her parents to be pretty authentic. I wish that she and her father had been less proud, but it felt true. There are minor problems: some of the plot turns are a bit extreme and threaten the realism of the story, Elsie's own turnaround comes on a bit too suddenly, Dionne has a distracting pattern of disguising some real life things and places (Shining Birches, the Darcy Thanksgiving Day Parade, Dusk vampires, etc.)! But I'd give the book some leeway since Dionne does such a nice job with the storytelling. Younger teens will like the story. Old folks will be reminded of why we don't ever want to be fourteen again!